Hey, remember the good old days of tupperware parties, where ladies gathered for crazy times and leftover storage? Yeah, me either, though I do know of other lady shindigs where you can buy other stuff which I will not make fun of, because friendship. 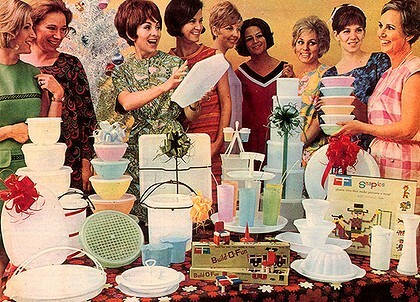 But tupperware started it all, ingeniously pairing love and loyalty with shopping. 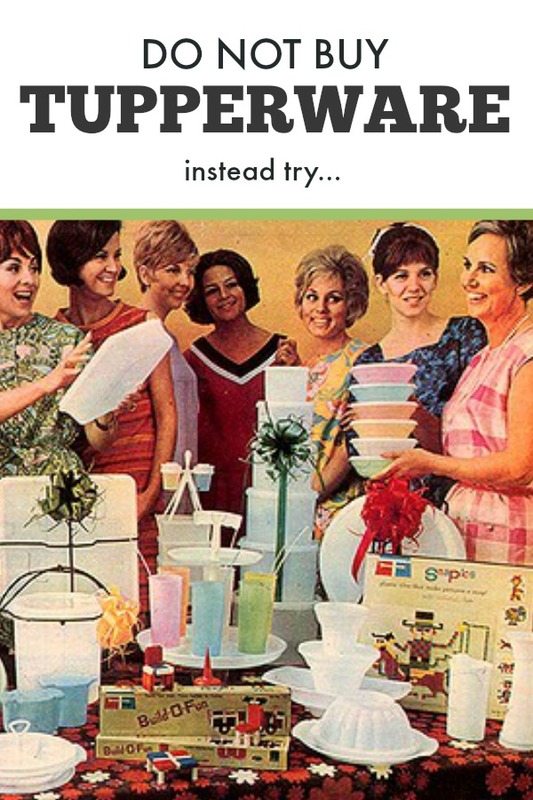 Anyhoo, in it's heyday, tupperware was supposedly interesting enough to warrant its own get togethers. Tupperware is less popular now, but plastic food storage is still unavoidable in most kitchens. All adults have to grapple with the mysteries of why the tubs and lids never seem to match. It's a rite of passage to have a bunch of mismatched plastic tubs and lids. But here is the thing about tupperware. It's plastic. And like most plastic, it isn't particularly food safe (even when it says it is) and it will add to the epic pile of plastic that is taking over our earth. There is over a ton of plastic for every living human being on Earth, and less than 10% is ever recycled. More and more bad news comes out about plastic, and we don't want to add to the giant hoard of plastic cluttering our world everyday. Plastic is a blight on our world and horrible for us, so why do we wrap our food in it? If you decide you are done with your plastic food storage- give it away to someone who will use it. If you just want to phase it out, be sure to keep using and replace as it is done. Are there ways to reuse it that don't involve food like craft or tool storage? Just tossing plastic in the trash is no solution either, but as you replace it you can do so with better options. Lucky for all of us, better options exist for our families and our earth. If you are going to buy food in packaging, make that packaging work for you! If it is good enough for your yogurt or cream cheese, it's good enough for your leftovers too. About 60% of our leftovers and freezer meals go into old yogurt containers. It helps assuage my guilt to get a few more uses out of one time plastic packaging. They are all the same size (no lid drama). Obviously, this is not a permanent solution, and you have to decide for yourself how many runs through the dishwasher feel safe. Even foodsafe plastic does start leeching chemicals after a while. 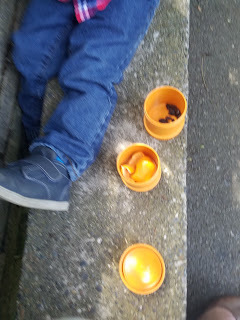 So those yogurt containers need a new use after a while, but they can be good for food at first. Also! If you start buying more of your groceries in glass (pasta sauce is a great example), you can reuse those containers forever. Worth remembering when you are choosing in the store! Glass jars are cheap, useful, and a perfect longterm investment. You don't have to keep buying them over and over again, they have so many uses (you can also use them for coffee or water bottles with a silicon lid), and you can use them to store leftovers and freezer food. 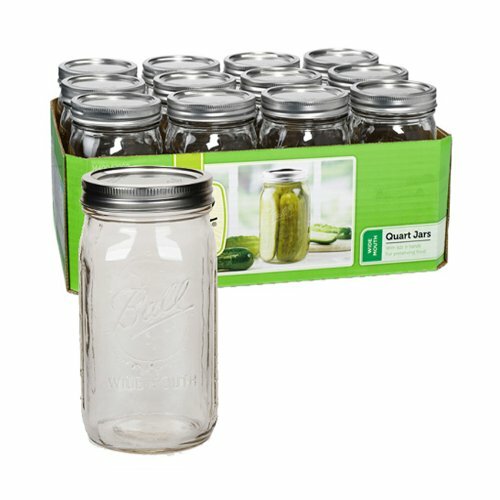 The classic Ball Jar comes in so many shapes and sizes (even colors) that you can find what works for you. Often for about a dollar a jar. It really makes you wonder how these perfect jars got upstaged by Tupperware (darn parties). 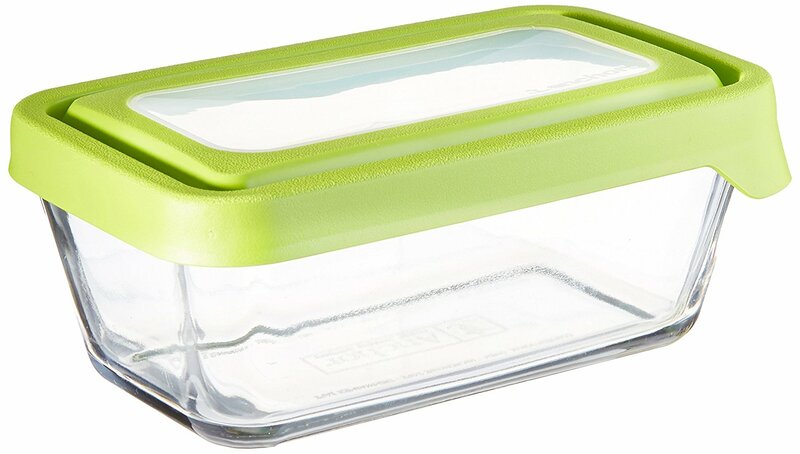 The two big glass makers in the US have growing lines of food storage/ leftover/ mean planning containers. Anchor Hocking has two lines, and more consistent sizes we like a little better. Glass is always a safer and healthier choice (though these still have plastic lids), and their True Seal line is especially awesome for food storage. So many of the sizes you actually want. 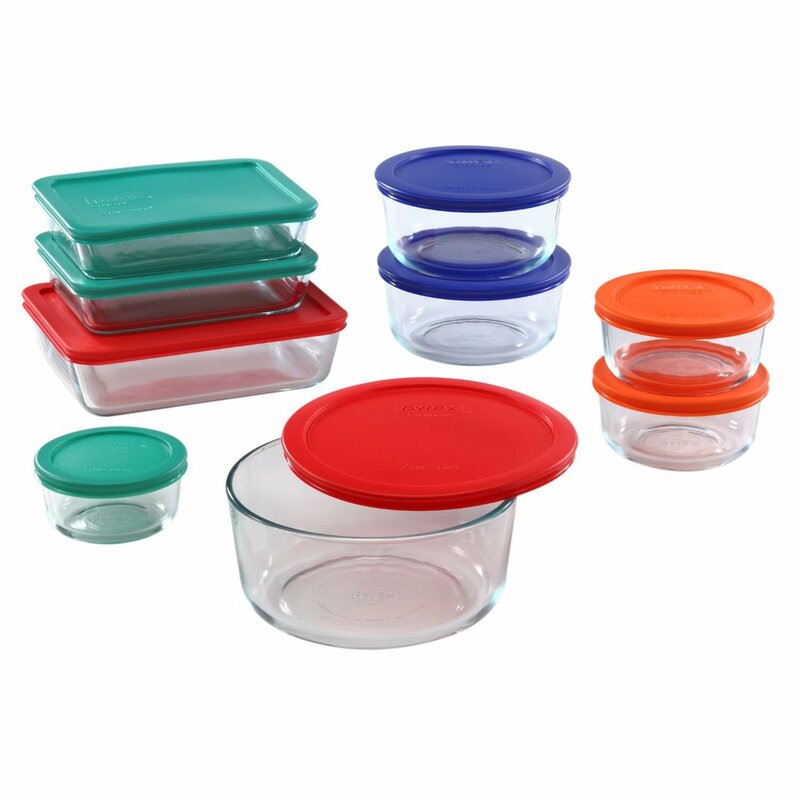 Pyrex also has Tupperware alternatives that are safer, cleaner, and made in America. I feel like they are less on point for this market, because they have some good variety sets, but fewer that are just the right size for freezer meals. Did you know that the Kardashians refuse to put their food in plastic? I didn't, some lady told me. But that means glass food storage is fancy and instagram-worthy, and clearly plastic makes you look like a non-famous peon. Also, check your local thrift shops for old Pyrex containers. 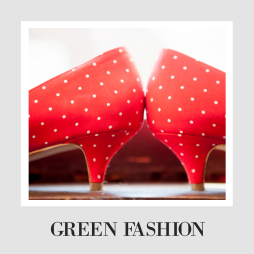 They last forever (as long as you aren't clumsy), so you can find tons of good stuff secondhand. Want something lighter that can stand up to kids (or just you- I know I break as much as anyone)? Preserve has brightly colored leftover containers and our family functions on our Replay snack containers. This isn't as much of a thing in our house, but it might be perfect for yours. I can't find any sets that are made in America, but I did find some sets that might be what lasts for you. Other simple switches? Cut out some plastic wrap by using beeswax wrap. Cut out ziplocks with reusable sandwich bags. Plastic is a blight on our waters, our world, and our health. So why wrap your food in it? Especially when so many other options are out there! 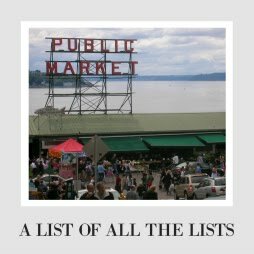 If you want more shopping ideas and inspiration for getting plastic OUT of your kitchens, check out the Giant List of Shopping Lists. I LOVE pyrex! It is the best gift, and most of my friends getting married have also put it on their registries. As an incredibly clumsy person, I have only shattered one, and the rest mostly bounce off the floor. Do you worry about breakage? I'm concerned they would break easily. I have little ones that aren't always (or ever) careful with containers. Do they hold up? Thanks for the info! Great info. I hate wasting food and this is eye opening about how you store your food. I have some pyrex but will also look into anchor hocking. Thanks for sharing. I always reuse my own containers. 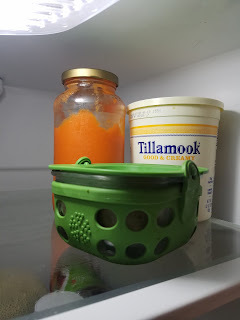 Whether it's spaghetti sauce, yogurt, or garlic; I always wash them really well and reuse them. I don't buy drinking glasses either anymore! Haha. such good ideas! i hate my tubberware cabinet and want to switch to glass! I have a lot of glass items and I keep them up top where my little one cannot get them, and the few plastic ones I dont mind about because he can toss them around all he wants.